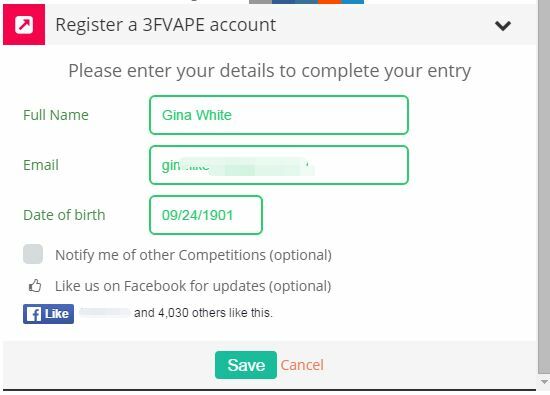 Thanks to the 3FVape fans, today we are going to hold a competition for you. 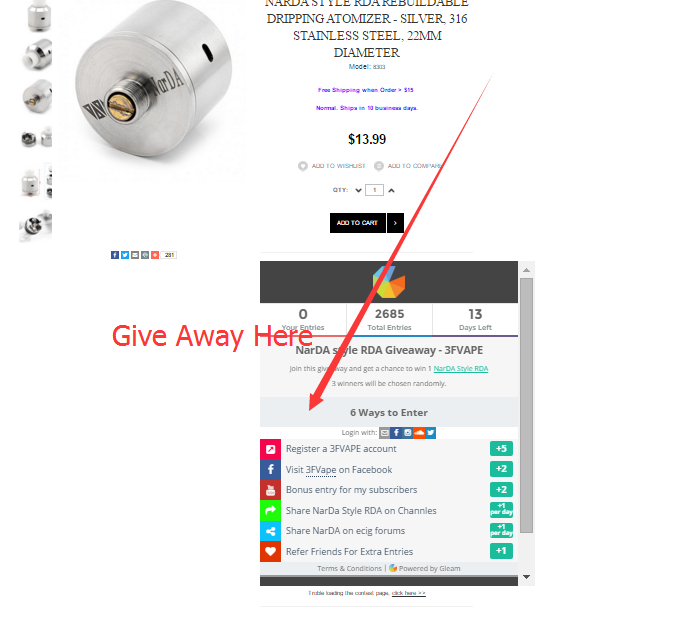 Winner will win a free Narda Stlye RDA Atomizer. 3 winners will be chosen on 21st, Mar (HKT). We will begin to ship after testing, based on order sequence. Giveaway Winner will be listed in the giveaway box on the above page. 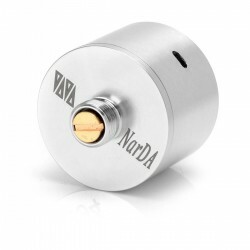 Let’s know more about the Narda Style RDA. The negative pole is milled into the deck. Narda Style RDA, versatile and adjustable airflow for “direct-lung” and “mouth-to-lung” hits. The following shows you how to join the competition. 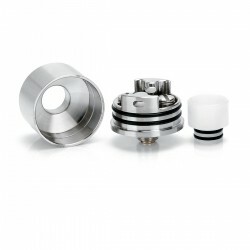 First, go to the Narda style RDA page. Then do as the picture says. Login the gleam.io to join the contest. gleam.io is a third party tool for this contest, it can guarantee the justice for users who join in and will select the winner randomly. We suggest you to use your email. And you can use this email to get the notification for updates of this contest. You have 6 ways to enter. Different ways get different points. 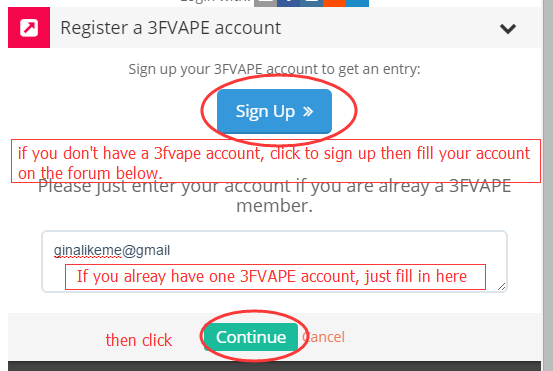 For example, You will get 5 points when you click Register a 3Fvape.com account to sing up. Just do as the guide say. If you are not login in the gleam.io tool as we mentioned above, it will require to login in using your email. Save and continue. it will show ✓ for successful join. You can go on for other entries. You will get 1 entry when share Narda Style RDA on the channels and 1 entry for share on ecig forum. These two ways to get entries can be done every day. Gleam.io will record your every entry and sum it up. 3 winners will be chosen on 21st, Mar. If your total entries is 15 and the total entries of this contest is 5000, your possibility to win 1 RDA will be 3 x 15 / 5000 = 0.9%. More entry, more chance to be the lucky one!Good luck to all my dear friends!